This t-shirt is fun specially if you like sloths as on the back of the shirt you can find a sloth holding on hitching a ride where ever you go. Yes this shirt is all about the back as the grey shirt is just plain on the front while on the back you can see the animal and it really looks like he is holding on. 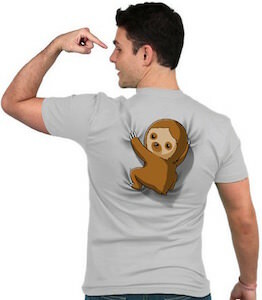 This t-shirt comes in style for men, women and kids and sure you need to take it extra slow with a sloth like this hanging on your back but it sure is fun and will get you noticed.